2014 BMW M5 Sedan SUNROOF, NAV, BACK-UP CAM, HTD LTH, H/K SYS, 21K! 14 M5, SUNROOF, NAV, BACK-UP CAM, HTD LTH, H/K SYS, 20IN WHLS, 21K, WE FINANCE. Secure Online Credit Application. Applying for a vehicle loan online is one of the quickest and easiest application methods. Our secure online application form is easy to complete, all you need are a few personal and employment details. Not all accidents or other issues are reported to CARFAX. The number of owners is estimated. See the full CARFAX Report for additional information and glossary of terms. No Airbag Deployment Reported to CARFAX. Vehicle Qualifies for the CARFAX Buyback Guarantee. No Structural/Frame Damage Reported to CARFAX. No Indication of an Odometer Rollback. No Total Loss Reported to CARFAX. 1724 LUNA RD IN CARROLLTON – 2 MILES NORTH OF 635. Year Make Model Mileage Engine. 21,110 M Twinpower Turbo V8 32v 4.4L Engine. Exterior Interior Stock# VIN. Sakhir Orange Metallic Black #593756 WBSFV9C53ED593756. View new window sticker. Ask Dealer A Question If you have a question, please call or complete the form below for a quick response. Body-Colored Rear Bumper Body-Colored Front Bumper Black Grille w/Chrome Surround Fixed Rear Window w/Defroster Perimeter/Approach Lights Fully Automatic Projector Beam High Intensity Low/High Beam Daytime Running Auto-Leveling Directionally Adaptive Headlamps w/Washer and Delay-Off Lip Spoiler Body-Colored Power Heated Auto Dimming Side Mirrors w/Power Folding Tires: P265/40R19 Front & P295/35R19 Rear Express Open/Close Sliding And Tilting Glass 1st Row Sunroof w/Power Sunshade Clearcoat Paint Speed Sensitive Rain Detecting Variable Intermittent Wipers w/Heated Jets Light Tinted Glass LED Brakelights Wheels w/Silver Accents Cornering Lights Body-Colored Door Handles Trunk Rear Cargo Access Black Side Windows Trim Galvanized Steel/Aluminum Panels Wheels: 19″ x 9″ Fr & 19″ x 10″ Rr M Light Alloy -inc: Style 345M. Air Filtration Front Center Armrest, Rear Center Armrest w/Pass-Thru And Skibag w/Storage Power Tilt/Telescoping Steering Column Proximity Key For Push Button Start Only Extended Merino Leather Upholstery Sport Leather Steering Wheel w/Auto Tilt-Away Leather/Metal-Look Gear Shift Knob Heated 20-Way Power Front M Multi-Contour Seats -inc: 4-way lumbar support, articulated upper backrest, adjustable thigh support, passenger’s seat memory, active head restraints w/adjustable side support and 2 position memory system for driver’s and front passenger’s seats, steering wheel and outside mirrors Driver And Passenger Visor Vanity Mirrors w/Driver And Passenger Illumination Remote Releases -Inc: Power Cargo Access. Head Restraints Driver Foot Rest Interior Lock Disable Full Carpet Floor Covering -inc: Carpet Front And Rear Floor Mats Smart Device Integration Engine Immobilizer Cargo Area Concealed Storage Power 1st Row Windows w/Front And Rear 1-Touch Up/Down Rear Cupholder Analog Display Delayed Accessory Power Trip Computer Integrated Navigation System Remote Keyless Entry w/Integrated Key Transmitter, 4 Door Curb/Courtesy, Illuminated Entry and Panic Button Full Valet Function Leather Door Trim Insert Garage Door Transmitter Illuminated Glove Box Fade-To-Off Interior Lighting Systems Monitor Power Fuel Flap Locking Type Power Rear Windows FOB Controls -inc: Trunk/Hatch/Tailgate, Windows and Sunroof/Convertible Roof Carpet Floor Trim and Carpet Trunk Lid/Rear Cargo Door Trim Instrument Panel Covered Bin, Refrigerated/Cooled Box Located In The Console, Driver / Passenger And Rear Door Bins Front And Rear Map Lights MyInfo Selective Service Internet Access Gauges -inc: Speedometer, Odometer, Engine Coolant Temp, Tachometer, Trip Odometer and Trip Computer Front Cupholder Dual Zone Front Automatic Air Conditioning w/Steering Wheel Controls Cargo Space Lights Power Door Locks w/Autolock Feature Outside Temp Gauge Day-Night Auto-Dimming Rearview Mirror Perimeter Alarm Ashtray 60-40 Folding Bench Front Facing Fold Forward Seatback Rear Seat Rear HVAC w/Separate Controls HVAC -inc: Underseat Ducts, Residual Heat Recirculation and Console Ducts Cruise Control w/Steering Wheel Controls. Manual Adjustable Rear Head Restraints Full Floor Console w/Locking Storage and 4 12V DC Power Outlets Tracker System Interior Trim -inc: Aluminum Instrument Panel Insert, Aluminum Door Panel Insert, Leather/Aluminum Console Insert and Metal-Look Interior Accents 4 12V DC Power Outlets 2 Seatback Storage Pockets. Transmission w/Driver Selectable Mode and STEPTRONIC Sequential Shift Control w/Steering Wheel Controls Rear-Wheel Drive 4-Wheel Disc Brakes w/4-Wheel ABS, Front And Rear Vented Discs, Brake Assist, Hill Hold Control and Electric Parking Brake Double Wishbone Front Suspension w/Coil Springs Gas-Pressurized Shock Absorbers Engine: M TwinPower Turbo V8 32V 4.4L 105-Amp/Hr Maintenance-Free Battery 5313# Gvwr 926# Maximum Payload Hydraulic Power-Assist Speed-Sensing Steering 3.15 Axle Ratio Automatic w/Driver Control Ride Control Suspension Transmission: 7-Speed M Double-Clutch w/Drivelogic Electro-Mechanical Limited Slip Differential 21.1 Gal. Fuel Tank Engine Oil Cooler Dual Stainless Steel Exhaust w/Chrome Tailpipe Finisher Regenerative 209 Amp Alternator Engine Auto Stop-Start Feature Multi-Link Rear Suspension w/Coil Springs Front And Rear Anti-Roll Bars. Low Tire Pressure Warning Back-Up Camera Side Impact Beams Outboard Front Lap And Shoulder Safety Belts -inc: Rear Center 3 Point and Pretensioners Rear Child Safety Locks Curtain 1st And 2nd Row Airbags Dual Stage Driver And Passenger Front Airbags Front And Rear Parking Sensors ABS And Driveline Traction Control Dual Stage Driver And Passenger Seat-Mounted Side Airbags BMW Assist eCall Emergency S. S Airbag Occupancy Sensor Electronic Stability Control (ESC). Other Vehicles Currently Available. That’s why we are the choice dealership. For many drivers in the area. We’ve built our reputation on trust, integrity, and respect, and we’re ready to demonstrate our elevated customer service to you. For our Dallas customers to test drive on our lot. We are also the dealership to visit if you’re interested in customizing and modifying Jeeps. To your personal preferences! Just see for yourself the kinds of changes we can make to the exterior and interior of our custom Jeeps. With us, you don’t have to go all over town to get your automotive needs met. You can even apply for car financing. Right now with our online application. 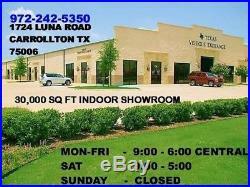 Or visit our convenient Carrollton TX location. We look forward to meeting you and putting you behind the wheel of your next vehicle! Direct Bank Wire Transfer, Certified Funds, Institutional Financing. SAME DAY APPROVAL IN MOST CASES. Out of State Buyers. The customer is responsible for registering the vehicle in their home state. The item “2014 BMW M5 14 M5, SUNROOF, NAV, BACK-UP CAM, HTD LTH, H/K SYS, 20IN” is in sale since Wednesday, February 21, 2018. This item is in the category “eBay Motors\Cars & Trucks\BMW\M5″. The seller is “tveauto” and is located in Carrollton, Texas. This item can be shipped worldwide. Sub Model: Sedan SUNROOF,NAV,BACK-UP CAM,HTD LTH,H/K SYS,21K!